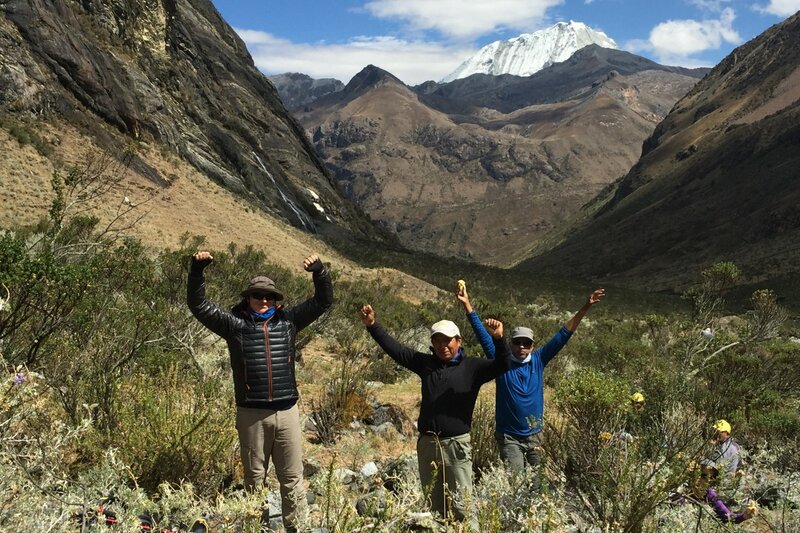 Tusker Trail is adding an additional trek to its Peru program after its first successful trek this past June into Peru’s Cordillera Blanca Mountains, according to Andrew Springsteel, U.S. operations director and South American guide. Andrew and Tusker founder Eddie Frank are planning a new standalone Machu Picchu 12-14 day itinerary based on the intel gleaned during the first Peru reconnaissance trek last August. The new Machu Picchu itinerary will include sections of the Inca Trail in and around the famed archeological site, but also off the beaten path sections where few trekking companies go. The inaugural Peru Trek itinerary this summer was a great start to Tusker’s South American expansion with good weather and multiple condor sightings in the Cordillera Blanca. The trip included a Machu Picchu extension and there were several itinerary changes suggested by Tusker’s in country guides that paid dividends. Several hikes were added in the Cordillera Blanca yielding more time in the mountains and less time traveling in vans to get to trail heads. “We originally planned to day hike Laguna 69 in the Cordillera Blanca, but we turned it into a two night campout with three days of hiking. We made the change because just getting to Laguna 69’s trailhead was a two and a half hour van ride each way from Huaraz plus a six hour hike. It made better sense to camp there two nights and the clients loved it,” Andrew said. This area offers the best view of the Cordillera’s highest peak Mt. Huascaran that soars over 22,000 feet. New acclimatization hikes in and above Huaraz were also added, including a trek to Pisco Mountain’s 15,000 ft mountain climber’s hut used to stage technical climbs. In Huaraz, Andrew connected with Steven Wegner, a University of California Berkeley educated archaeologist, who has lived in the Peruvian Andes for 20 years. Steven hosted Tusker’s first group this past June, on a tour of the Ancash Archeological Museum where he breathed life into ancient stone sculptures that depict male and female warriors. The museum visit was helpful in understanding the historic sites the group found on the trail. There where multiple petroglyphs and several burial sites of high echelon pre-Incan leaders encountered on the four night trek into the Quillqueyhuanca Valley. On the Machu Picchu extension, Andrew changed things up, encouraging the group to make an extra effort to beat the crowds. After getting off the train from Cusco, Andrew had the group moving. Machu Picchu averages 3,000 tourists a day despite a 2,500 limit placed by UNESCO. Groups need to be nimble and ready to go the extra mile to experience the full Machu Picchu immersion and that’s what Eddie and Andrew are planning for 2017. Tusker will again visit the Cordillera Blanca, a 180 km range featuring over 700 glaciers and 270 lakes. There will be a seven day Machu Picchu extension, but Tusker will also offer a free standing Machu Picchu trip designed to include the archaeological site but give trekkers the historical backcountry feel of the Inca Trail that connects other significant and far less visited sites. So stay tuned for 2017 itineraries that should be out in the coming months. Hats off to those intrepid Tusker tribe members for being part of the first Peruvian trip this summer. They showed a willingness to go with the flow to maximize every minute of their journey.